Bodh places considerable emphasis on learning from grassroots experiences in varied classroom and community settings. Moreover, these learnings can be consolidated in the form of emerging issues for action, innovative approaches/frameworks and promising practices. In this context, research and documentation assume tremendous significance. Scientific rigour and spirit of enquiry are fundamental to the research approach. It is these aspects that Bodh has sought to increasingly imbibe in all its efforts. This has led to the adoption of baselines and evaluations as an integral part of programme frameworks. Management of Information Systems (MIS) is also being strengthened. Reflections and analysis by internal teams has consistently formed the basis of pedagogical and curricular enhancement and innovation. Various studies have been undertaken. Academic experts and other consultants are being increasingly engaged to undertake specific tasks and also enhance team capacities. Incidentally, a research component was also included in the previously conducted teacher fellowship programme. 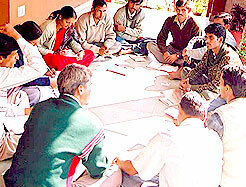 At the school level, teacher collectives are encouraged to document, discuss and analyse their work in classes and in communities. Teachers maintain anubhav diaries (experience diaries) wherein they record their observations and insights. They also maintain systematic records of each child, their daily and monthly plans, minutes of all key meetings (in school and with communities). In fact, teachers are encouraged to develop as reflective practitioners who can utilise the research approach in their work. Besides the teacher collectives, programme functionaries at various other levels are also involved in documentation. Photo documentation is also undertaken. However, it is felt that a lot remains to be done. The richness of experience and the inherent potential is yet to be covered fully.